Um, I’m confused, that looks like Superman, and I can’t imagine a DC/Marvel crossover. What gives? 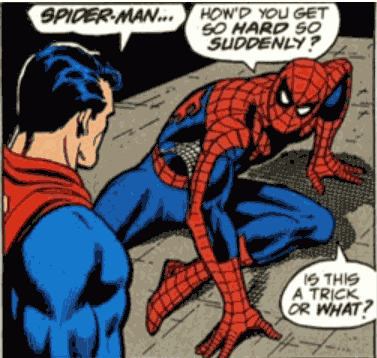 This panel alone has made me rethink everything I knew about Spider and Superman. There have been DC/Marvel crossovers over the years. A few years ago, Stan Lee wrote origin stories for top DC heroes, putting his own spin on the characters. Thanks for the help, Frankie! I never got into comic book culture–couldn’t afford it growing up. If anyone cares, this scene involved Spider-Man being dosed with ‘red sun’ energy. While it lasted he was able to fight Superman on an even level. But yes, it does sound odd out of context. The DC/Marvel cross-overs are available in reprint collections. My public library had this one. Not a bad story. The characters even mentioned not having met before. So that’s why Supes avoided marrying Lois for so long. Somewhere there’s a panel with spiderman saying “sorry, I didn’t mean to make your face all sticky”. If anyone can find it please post a link – I smell an adults only mash-up!